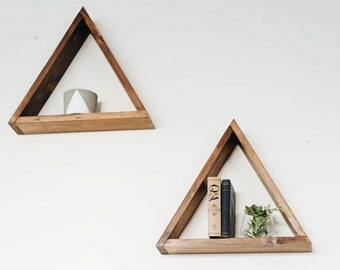 These hanging shelves are the perfect piece for any rustic, minimal or natural home decor. 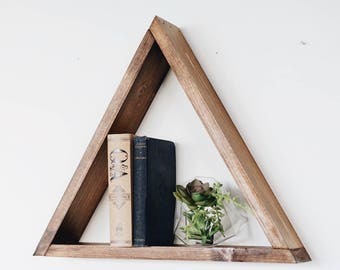 These shelves are available in different finishes/stain color, making them a great fit in any room of the house. 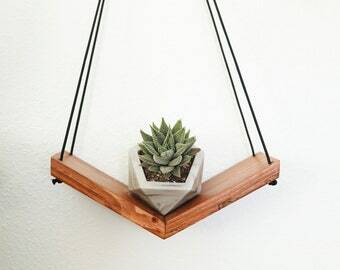 Hung with cord or rope, they have a unique, rustic yet modern charm. 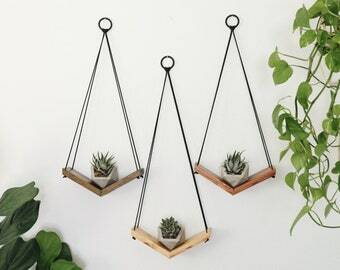 They're designed to be adjustable so that hanging and leveling them is a snap - these shelves can be hung from one nail or hook, literally in seconds.They are great as candle holders but can be used in the kitchen, holding spices or mason jars, or in the bathroom used for hand towels or toiletries. 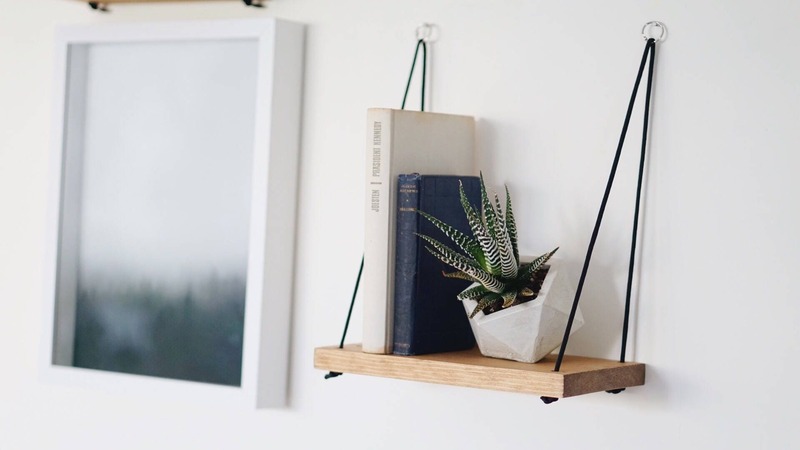 They are perfect as planters, or even next to the bed for your books. Their simplicity makes them versatile! All COLOR CORDED shelves come with the ring included. 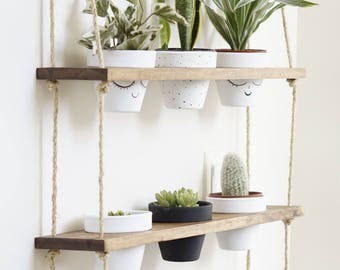 ROPE shelves on the other hand, are arranged in such a way that does not require a ring and therefore will be shipped without it. Rings are for decoration purpose only. 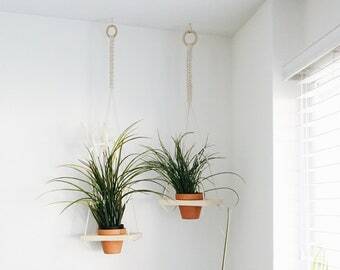 Should your decor consist of mostly Gold accents or you simply prefer to hang without it, simply latch off. 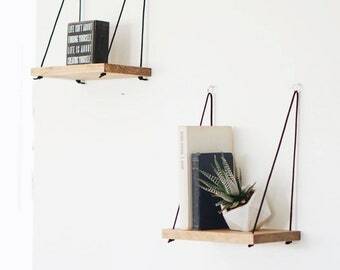 These shelves can also be customized in a number of ways, so make sure to select from the dropdown options. Choose your stain from the dropdown. Every piece is different with grain and its own uniqueness due to its handmade nature, so color will vary slightly. If you do not see your stain of choice in the dropdown, message for availability. When purchasing, choose both a STAIN, CORD + RING color. 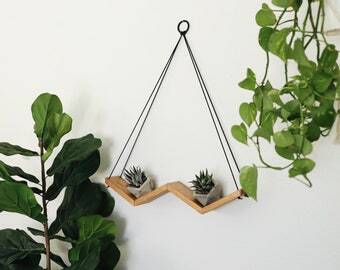 Leave us a note if you would like them to hang in a triangular shape from the top or for the rope/cord to be separate like a swing. 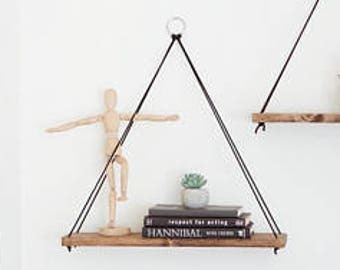 IF NOT SPECIFIED, shelves will be sent as a swing. **Every piece is different with grain and its own uniqueness due to its handmade nature, so color will vary slightly. (Monday – Friday, excludes holidays). Custom Orders are welcome~ Not quite what you had in mind? Message me with questions! 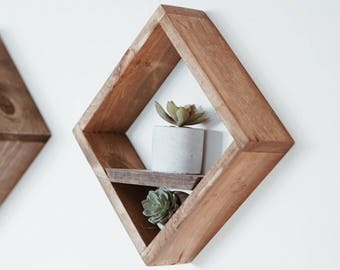 PLEASE NOTE: Since every piece is unique, the item and stain color you receive will be very similiar but not identical to the photo. Thank you for checking out BijouxLu & Co. FAVORITE our shop as we continue to add more pieces to this collection! » Please note, due to the handmade nature and customizations of our products, processing time may be longer than listed. » Shipping rates are calculated through USPS based on the size and weight of each item in addition to the location it will travel to. ▹ Multiple item purchases may be eligible for combined shipping discounts. Message us prior to placing your order to assure that your items can be shipped together for this perk! I love it so much! It was also super easy to hang up all by myself! 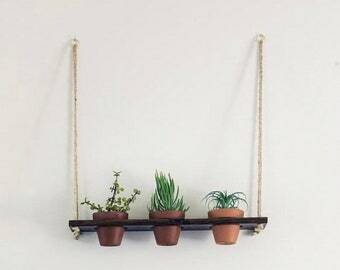 As amazing as this shelf is (I now have 3), the customer service is even more amazing. Thank you ! 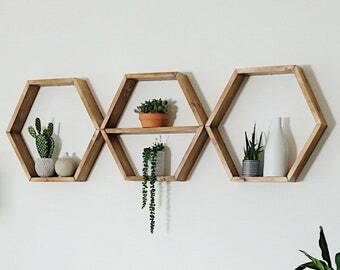 The shelves are amazing and so simple to hang. It's so great being able to get my speakers off of my desk ! If you do not love your piece, please contact me within 7 days of receiving the item and I will refund your cost (not including shipping) or exchange for another piece. You are responsible for return shipping costs unless I make a mistake on your order. Returned items must be in original condition and packaging (that includes the box). I am not accepting any returns on pieces that have been used, broken or tarnished due to improper handling. If you would like to change the pieces whether it be the stain, paint, cord, dimension, style or hooks, please contact our shop. Please allow me extra time for custom pieces. Reserved order will only be held for 24 hours. Have a piece in mind and can tell from my shop that we can make it, message us with your ideas, photos and measurements. If not an LA local, large items will require a higher payment for your item to be sent in a shipping container. I live in LA, can I do a local pickup? Absolutely. Our shop started as a local pickup business and we continue to sell in LA Flea Markets. You can place an order and if you don't want it shipped, we can arrange to meet at one of our events. Keep up with us on Instagram @BijouxLuCreations for weekly event updates! All of our items are sealed for indoor protection. If you are interested in displaying outdoors, make sure to message us so that we can further prepare to withstand the outdoors. All orders come in their own box. I do not include receipts, so if you are shipping it to someone directly, leave me a note during check out with the wording for a note to the recipient and the occasion.